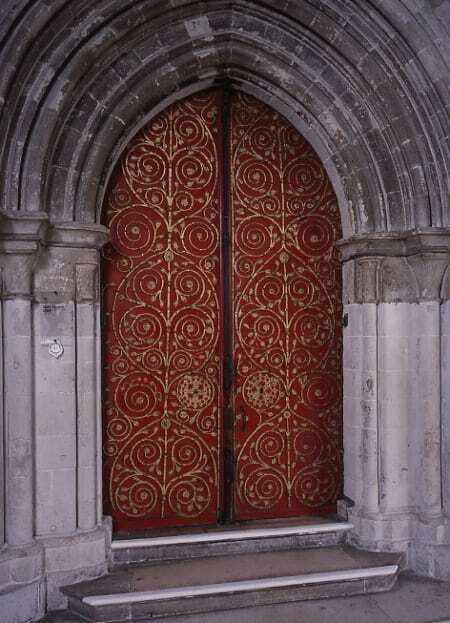 The Gilebertus door has been standing since the mid-thirteenth century and is one of the few surviving parts of the earliest chapel at Windsor Castle. The east wall of the present St George’s Chapel was originally constructed as the west wall of Henry III’s Chapel of St Edward the Confessor. The Galilee porch, now standing between St George’s and the Albert Memorial Chapel is almost all that remains of that first building, to which the Gilebertus door would have been the main entrance. Today the door is rarely used, though hundreds of tourists and visitors to the Chapel pass by it every day and have the chance to admire its decorative ironwork. However, when Her Majesty the Queen and other members of the Royal Family attend services at St George’s (for example at Easter) it is through the Gilebertus door that they enter the Chapel. The spiralling design of the ironwork is a stylised tree, with leaves, flowers and small animals decorating the stems. Very unusually for a work of its time, the ironwork bears a name; a number of the leaves among the design are stamped with the letters +GILEBERTVS. This name cannot be attributed to any one individual with absolute certainty and there has been speculation about whether it is more likely to refer to the craftsman or a patron of the work. A number of men associated with Windsor Castle at this time were named Gilbert, including Gilbert de Tile, bailiff c.1255-60, and Gilbert de Grange, viewer of accounts, c.1243-47, and could have helped to finance the work. One contender for maker of the door is moneyer Gilbert de Bonnington. Makers of coins, unlike other medieval craftsmen, are known to have stamped their names into their work in just the manner that is seen here – the cross to mark the beginning of the name in particular is a common feature in coin design. De Bonnington is known to have been active as a maker of coins during Henry III’s reign, in charge of the Archbishop’s mint in Canterbury. Furthermore, some of the stamps used as decoration in the ironwork of the door are very similar in design to the long-armed cross coin design that was introduced by Henry III in 1247 to prevent coins being clipped. These may be mere coincidences, but they have made de Bonnington a popular candidate for Gilebertus. The lozenges of the ironwork were originally complete and did not stop part way through as they are now seen to do. The lower part of the door was cut off some time during the later nineteenth century. It is possible that this was connected with the redevelopment of the Lady Chapel on the other side of the Galilee Porch into a memorial for Queen Victoria’s husband, Prince Albert (d. 1861), which might have required the height of the floor to be altered. In spite of this mis-treatment, the door has survived in the main as it was when it was first made. Stamping on iron surfaces was much harder to achieve than on the more malleable gold of coinage and in the thirteenth century the technology for achieving this was still very much in its infancy. 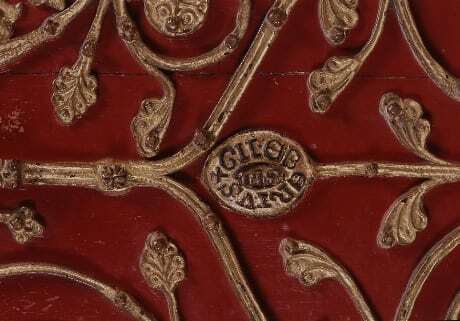 The Gilebertus door is the oldest known example of stamped ironwork in England.